Welcome to the 11th week of the Pitchfork & Crow Winter CSA! Hakurei Salad Turnips – slice ’em up and eat them raw, or cook them if you have to. And don’t forget about the greens! Cabbage or Collard Rapini – this stuff is amazingly tasty! Chop it all up, saute, and add to eggs or over pasta for deliciousness! A couple weeks ago I was lamenting our early spring compost buying decision and wishing things were a little greener in our propagation house. This week I’m happy to report that things are looking up. We transplanted our first lettuce starts this past week and are set to continue the transplanting in the coming days thanks to this sunny weather. 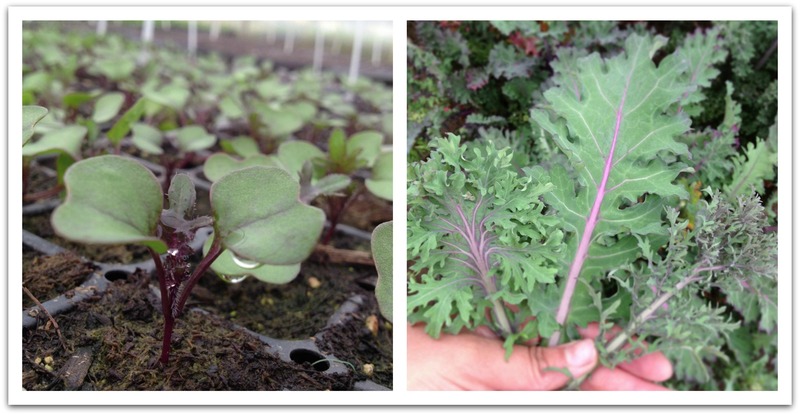 Bok choy, broccoli, cabbage, kale, peas, chard, and beets are all headed into the field very soon. Our plan hinges on multiple successions of most crops and because we rely on transplants for most things, we’ve been spending a lot of time sowing seeds in the prop. house. This leaves a big chunk of time for reflection. Somewhere between thinking about efficiency and speed my mind inevitably turns to the seed at hand. We purchase seed from a dozen or so seed companies. The list includes local favorites and larger companies and the seeds range from open-pollinated heirlooms grown right here in the Willamette Valley to hybrids grown in Holland. Of course we don’t knowingly grow any GMO seed and we purchase organically grown varieties whenever possible. That said, there are a lot of choices out there. Like many decisions we make as farmers, we think about which varieties work well in our system and on our farm. We think about which varieties we like to eat and which we like to grow. These choices will rarely be the same from one farm to another, though it’s been my experience that farmers like to chat about varieties quite a bit. When I’m in the prop. house sowing seeds into flats and dreaming of future veggies, I’m also mentally reviewing our choices. I unconsciously smile when we sow seeds from some seed companies who I’ve met folks from personally. We know some true seed stewards and are happy to support them whenever possible. I tend to question our choice when sowing seed from larger, distant seed companies. The origin of the seed is often vague when purchased from larger companies and it often ends up in the rotation due to few alternatives or for some specific trait such as cold-hardiness for instance. We’re lucky to live in a location where so much specialty seed is grown. Having quality seed available that is adapted to our climate is a very lucky thing. This week we’ll be sowing our winter squash and melon seeds for transplanting next month. These are big plantings for us and it’s fun to see so many different seed varieties from so many seed companies represented. The genetics in those small seeds is astounding too. We’re already looking forward to the sweet summer melons and the fall squash! In a food processor, combine the walnuts, garlic, arugula, Parmesan, and 1 tsp salt and pulse to blend. With the machine running, pour in the olive oil through the food tube in a slow, steady stream and process until smooth, stopping to scrape down the sides of the bowl as needed. Taste and adjust the seasonings. Melt butter with oil in heavy large pot over medium heat. Add leeks and onion and sauté until almost tender, about 10 minutes. Stir in potatoes, celery roots, thyme, and bay leaf. Add broth and bring to boil. Reduce heat, cover, and simmer until vegetables are tender, about 40 minutes. Add celery stalks and simmer until all vegetables are very tender, about 12 minutes longer. Cool slightly. Using handheld blender, puree soup in pot. Stir cream into soup. Season to taste with salt and pepper. (Can be prepared 1 day ahead. Cover and chill celery leaves. Cool soup slightly. Chill uncovered until cold, then cover and keep chilled. Rewarm soup over medium heat before serving.) Ladle soup into bowls. Garnish with reserved celery leaves and serve. As always, a zillion thanks! I love getting my shares, chatting and reading your comments every week! I have been forwarded on your emails to my niece and her husband, who are thinking of getting into the same business at some point in time — you are provided them inspiration! Don’t worry — everything will be fine — I admire what you are doing — in multiple ways — you do a great job and are following what I would assume to be your dream . . . ..